Talkwalker, a social media analytics company, based in Luxembourg, takes a closer look at the IPL buzz, using their platform. Whose hashtags are having more impact?Knowing now that CSK are leading in mentions online, it’s interesting to dig deeper and see if the content of mentions are carrying their team hashtags! 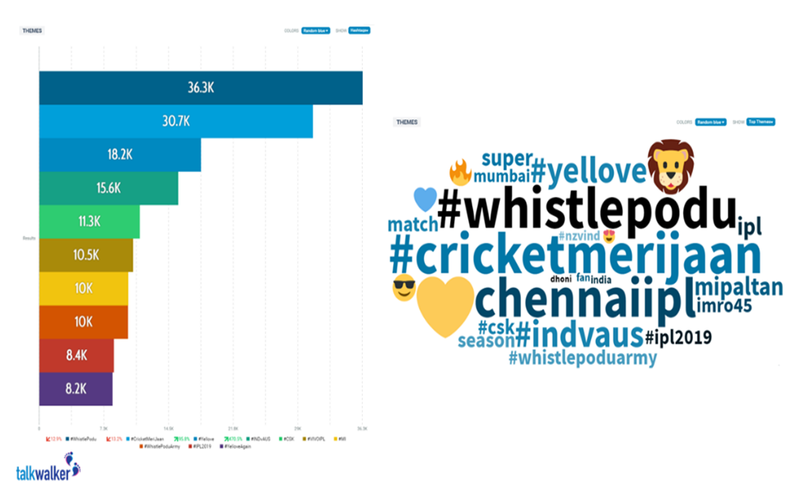 By zoning in on India alone, it’s #whistlepodu that is most mentioned! #cricketmerijaan is not far behind however, by only 5.6K! Seems the competition both on and off the pitch is heating up! The conversation is full of hearts and lions! The tournament may be a fierce one, but the social conversation is full of hearts and lions. CSK’s lion may yet again be the winner of the most used emoji contest, but it sure looks like there is a lot of love in the social chatter (both yellow & blue hearts) running up to the start of IPL 2019. No matter which team you find yourself behind. One does wonder, however, does CSK’s social win here predict any future turnouts? Who knows? – You better tune in to find out. We know we will!